When writing family history stories one may need to use a fraction of a year for expressing a person's age or if transcribing from a document one may find a person's height or weight expressed with fractions. A knowledge of keyboard shortcuts helps, and the oft forgotten ALT key with a number pad provides the solution. For those accustomed to using word processing programs the Insert symbol or Insert special characters gave access to fractions and a variety of other useful symbols. Maths teachers have long used insert equation in MS Word to produce those endless worksheets and exams. Many of us just need the simple one quarter, one half and three quarters. 1. Access the list of codes from Useful Shortcuts or from Keynote support. 2. Save for ready reference in Evernote or Google Drive, tag as codes, symbols, fractions. 3. Ready to insert? Switch on NUM LOCK, hold down the ALT key and type the code you need. If your keyboard does not have a numeric keypad you can still access the numbers by finding the FN key with NUM Lock in the same colour on your keyboard. Remember to turn if off after you have used the code you want. So for ¼ I have NUM LOCK turned on, held down the ALT key and typed 0188, ½ is 0189 and ¾ is 0190. Fractions may be highlighted as with any other text to alter size or bold. This works in both Blogger and Wordpress blogs. I find this a much easier method to insert fractions rather than having to use HTML coding. If you are typing your blog post on an iPad the easiest way to get fractions is to add them as text short cuts. Tony Mortlock has a post Fractions on the iPad with instructions on how to add them as shortcuts. Do you have another simple method of adding fractions to your blog posts? What works as a title? I settled on Hippo Sized Hints for this post. I’m practising what I’ve learnt today. Three word titles - preferably with some contrast or a conflict of ideas. This was just one example of the hints and tips received by an enthusiastic audience at Cooroy Library this afternoon. In small groups of three we took the role of an ancestor and were interviewed by the others to relate that ancestor’s story in the first person. This provided an excellent focus for revealing gaps in known information. Other exercises had us concentrate on including all five senses in describing a place or room of significance. Writing a Non Boring Family History is available as an ebook from Hazel’s online store. 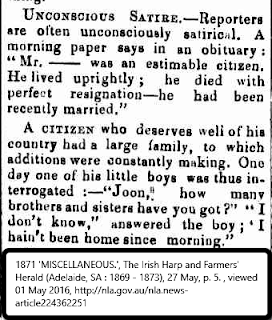 In order to keep abreast of newly digitised newspapers on Trove, I use a feed reader to deliver the latest titles. One can select from a variety of RSS feeds to keep up to date. Two popular feed readers that can be used on both computers and mobile devices are Feedly and Inoreader. How to start using Feedly by Richard Byrne from Free tech for teachers. Add your choice from these feeds to your favourite reader to keep up to date. If you click on these links on a mobile device you will need to choose to open in a feed reader or news app. Thanks to the Trove team at the NLA for providing this valuable service. 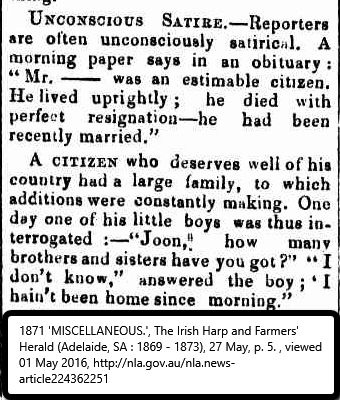 Here's a snippet from The Irish Harp and Farmer's Herald of 1871 for #TroveTuesday, enjoy! Here’s a summary of the posts written along with the apps I covered in the A-Z challenge. Hopefully, you may find a useful app from these quick overviews. Thanks to all those who visited and commented along the way. Here’s my Pinterest board on the A-Z of apps in April. Follow Carmel's board Apps A-Z on Pinterest. If you don’t use Pinterest here’s the list alphabetically. To view a select few of the other many bloggers who participated, here's a magazine of 300+ articles from family historians and genealogists.